I really enjoyed reading the story of Fliss who is desperate for a second baby with husband Ben. He works in London during the week and is only home for a short while at the weekend. Fliss begins to suspect that it is more than their short times together which is causing her difficulty in conceiving but Ben is strangely reluctant to have any investigations. She signs up for a reality tv series about second time infertility. The cameraman is the lovely Leon, who has himself been let down in a previous relationship and is wary of getting involved again. Despite the circumstances, attraction grows between them though it doesn’t seem likely anything could ever happen. I found myself really empathising with Fliss throughout the book and I’m sure that any woman who has tried with difficulty to have a baby will relate to her. Fliss was a lovely character, very strong but also emotionally vulnerable. I suspected that something was going on with Ben but didn’t guess the full extent. Leon was also a great character – very caring towards Fliss even when he didn’t think a relationship was possible. The strength of female friendship was clear as Fliss met up with online friend Ange and the two women formed a strong bond in real life too. Catherine Miller was really skilled at creating an emotional response and making me care about her characters. 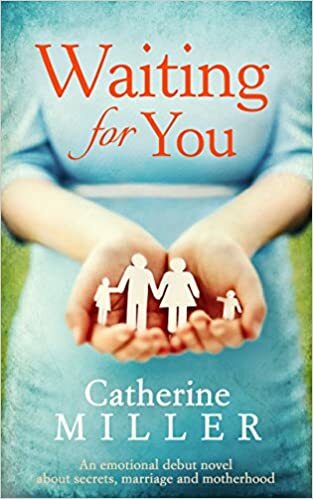 Waiting for You was an easy book to read as it was so engaging. The writing flowed well and it was well plotted out. There were quite a few surprises I had no idea were coming, just when I thought I had it all worked out! The ending was really lovely, a great way to end a really good book. You’d never guess that Fliss Chapron doesn’t have it all. All Fliss wants is to see two blue lines telling her she is pregnant with her much longed for second baby. But as the negative tests stack up, dreams of completing her perfect family feel more hopeless every day. As Ben becomes increasingly distant, Fliss begins to question whether her desire for a baby is just a sticking plaster to save her marriage. Because in the end, how well can you ever know another person…even the man you’re married to? Really good review, I’m adding the book to my list. I love what the back cover says, especially the last line! So true for so many women! Oh dear – I seem to be adding to your list quite a bit this week! Thanks for your comments, much appreciated.